Hi guys, I'm busy with this mockup, it's from the genesis game: X-men 2: Clone Wars. I intend to add two characters to the scene as well as one or two enemy sprites. Amazing job, and good details as always. I can't wait to see character sprites. In my opinion you should use the same effect (gradient pixels instead of ditering or vice versa) for rotation lights and Sentinel eyes, cause this way this way they look like they don't belong to same style. I love scanning animation on monitor and reflection on turned off monitors. Shadows on Sentinels collar are very strange for me, cause I can't determine position of light sources that create those shadows. In background you should keep metal construction, but instead of doors and black walls you should add another plane and give the scene more depth. Looks ace! but howja mean 'from the genesis game' are some elements taken directly or remade, what are we critiquing? oh yeah it's really amazing. I really like colors and shading. Maybe the behind should be darker ? Fantastic stuff. I can't comment on the accuracy of your sentinel shading, all I know is that it looks very, very pretty. - The lower stance looks very unnatural, because he has a very wide base, yet his legs are relatively straight, so while at a glance he looks ready to pounce, it actually just looks very awkward at closer inspection. Even with superhero powers, I'd expect him to bend his knees slightly before lunging forwards. - The upper stance looks more realistic, because it looks like a normal wrestling stance (google it and you'll see what I mean). Maybe that was already your inspiration. It makes sense, because a lot of wrestling styles feature explosive leaps forward, so they're stood very low, almost like a sprinter. - While the lower stance is less realistic, it's ten times cooler than the more realistic wrestling stance. It looks more dynamic, more badass. Especially because of the arms. Maybe you could do something interesting with the arms, while still having his rear foot ready to push him forward, in a realistic fashion. I'm probably going to totally eradicate any sort of credibility in this post by doing these crappy edits, but here's... some crappy edits. But even disregarding any of my ideas, I still think the knee of his rear leg needs to be pointing forward to make any kind of explosive forward movement more realistic. Shading on sentinel is now much better. 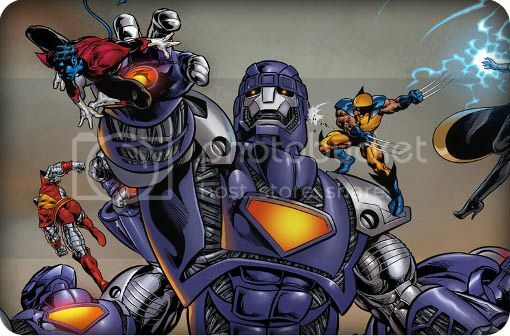 I have a problem with sentinels face, cause it looks to plain compared to dynamic lights and shadows on his body. Maybe you should try to redesign his face a bit to make it more badass and give it more dimension. 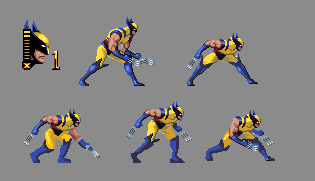 About Wolverine stance the lower one is better (better than original), but one of his legs should be bended because of the balance. IMO in this case front (his left) leg should be bended. This way his weight is on his front leg, and that enables him to charge forward, when user press "->" button. Also his boots in this version are to deep, way above his knee, which makes his legs look very strange. About Wolverine portrait, it looks a bit like Nite Owl from Watchman. I know this is not the same costume, but maybe try to achieve something like this. I think that you should make some animation out of this, like short gameplay. I'm probably going to totally eradicate any sort of credibility in this post by doing these crappy edits, but here's... some crappy edits.